The C major ‘Great’ has often been cited as the first of the big romantic symphonies and an open door leading to the Romantic era. 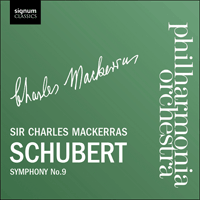 We owe the belated emergence of this symphony, 11 years after Schubert’s death, to Schumann who described it as 'a symphony for the benefit and enjoyment of the whole world' and it is here performed by the Philharmonia Orchestra and guest conductor Sir Charles Mackerras. Deep down in this symphony there lies more than mere song, more than mere joy and sorrow, as already expressed in music in a hundred other instances. It transports us into a world where we cannot ever recall having been before. Who knows how long it would have lain there in dust and darkness, had I not immediately arranged with Ferdinand Schubert to send it to the management of the Gewandhaus concerts in Leipzig. The symphony reached Leipzig, where it was performed, its greatness recognised, performed again and received with delighted and almost universal admiration … for the benefit and enjoyment of the whole world. Schubert appears to have begun work on the symphony during the summer of 1825 and completed it in 1826, with ongoing revisions continuing into the first months of the following year. The fact that the composer’s autograph manuscript bears the date March 1828, in his own hand, might be explained by Schubert presenting the symphony to major publishers early that year and wanting it to be regarded as a new work—hot off the presses, as it were. Already, late in 1826, he had dedicated the symphony to the Gesellschaft der Musikfreunde in Vienna, and in return received 100 florins from the Society. Unfortunately, this was not a fee which might then ensure a performance of the work, but only an honorarium to recognise Schubert as being worthy of consideration. Although rehearsed by the Gesellschaft, no performance was ever forthcoming, seemingly due to its difficulty and length, lengths which Schumann would later describe as ‘heavenly’. And so the work was set aside until, at Schumann’s behest, Mendelssohn conducted a partial version of the symphony in Leipzig in March 1839. Despite this relatively successful premiere, orchestras in other musical centres were cautious of performing the full version for many years. The ‘Great C major’ has often been cited as the first of the big Romantic symphonies. In marked contrast to the wistful, personal nature of Schubert’s previous symphonic outing (the so-called ‘Unfinished’), the 9th Symphony is an extended essay which is confident, outgoing, discursive and expansive in nature—rather more public than personal. Although, much like Beethoven’s own 9th symphony, it is always looking over its shoulder at earlier, Classical models, Schubert’s final symphony is an open door leading to the Romantic era. Already we are looking forward to the symphonic work of, among others, Brahms, Dvořák, Bruckner and Mahler. Horns quietly breathe life into the opening Andante with a haunting, irregularly shaped melody which is taken up by the woodwind as a plaything for gentle, lyrical purposes and then for dramatic fortissimo statements by the strings. A second theme begins to emerge now—an ascending, dotted-rhythm scale which, together with the opening sotto voce horn call, will figure throughout much of the symphony, in one form or another, acting as motivic glue for the work as a whole. A delightful woodwind passage follows, shielding us momentarily from the public gaze of the grand symphony and dipping briefly into Schubert’s private world of song composition, before a brief orchestral frenzy brings us back to the work’s opening of C major and into the main Allegro. The secondary theme from the Andante now emerges, jaunty, confidant, irresistible, in the strings. Tension starts to build in the orchestra until it is arrested by a hymn-like passage of great intensity where the opening theme on the horns comes forth in the trombones with the strings resplendently picking up the other motivic material to provide one of the symphony’s most majestic, and justifiably famous, passages. Similarly inspired, the development section is awash with everything from brilliant fortissimos down to the most sublime, hushed tones. Even as Schubert reaches the closing section of the movement, the coda, his protean invention is barely contained by the necessary formal constraints. The movement closes triumphantly in a blazing statement of the opening horn theme. The second movement, Andante con moto, opens with a steady string accompaniment to a sweetly plaintive melody on the oboe, which has a folk-like character in its simplicity and veiled quirkiness. This theme is varied with the addition of a clarinet whereupon the oboe returns before the orchestra begins to agitate, at points verging upon anger. After a reprise of the beguiling oboe melody, a second theme enters the scenario, pianissimo in F major, and after some marvellous treatment, is followed by an exquisite moment Schumann describes thus: ‘a horn is calling as though from a distance, that seems to me to have come from another sphere. Everything else is hushed, as though listening to some heavenly visitant hovering around the orchestra’. The opening theme returns to introduce an extended, often fiery, orchestral passage which gives way to a most delightful solo from the cellos. After further treatment of the major themes the movement ends with a return to the opening oboe theme. The lively Scherzo begins with forceful strings in unison, complemented by frolicking horns and oboes. This amusingly boisterous opening, which pervades the whole movement, is counteracted by charming waltz-like themes that pop up from time to time—the first of these acting as a secondary theme. The Trio section is given its cue by horns, clarinets and trombones which lead into a broadly conceived melody in the woodwind with string accompaniment. The traditional return to the Scherzo closes this thrilling, densely orchestrated movement. The Allegro vivace finale is not only Schubert’s most impressive single orchestral achievement, but one of the major landmarks of the whole symphonic repertoire. This is a movement of tremendous power and utterly remarkable for Schubert’s endlessly inventive nature being met with a masterful control of his material and resources. The opening call-to-arms by the full orchestra is ear-catching and sonorous, immediately outlining two very short, but dominant motifs. The forward momentum is maintained majestically until, quite suddenly, new melodic material emerges as the first major theme, quietly on the oboes and bassoons with whirring triplets in the accompanying violins. This song-like material is swept along by the orchestra until a huge G major chord demands silence for two complete bars, breaking the momentum and allowing the second theme to be introduced. This fine melody is pursued through all sorts of keys, harmonies and rhythms and is followed by a tumultuous tossing around of the major themes and motifs. The symphony’s titanic coda is one of music’s wonders—some 180 bars where which the thematic, harmonic and rhythmic essences of the symphony come together, as one—in Schumann’s words, ‘for the benefit and enjoyment of the whole world’.